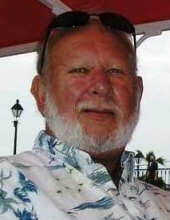 Robert Walter “Bob” Gay, 74, passed away on Friday, November 16, 2018 at Wayne UNC Hospital. Bob was born in Detroit, Michigan on March 7, 1944 to the late John Walter Gay and Helen Sarna Gay Hefferton. He proudly served his country in the United States Air Force. Bob retired as a mechanical engineer in 2001 from APV Baker in Goldsboro. He was a true sportsman, most comfortable outdoors, on the water fishing. A private service for the family will be held at the Eastern Carolina State Veterans Cemetery with military honors. Bob is survived by his wife of 41 years, Kathleen “Kam” Gay; sons, Brien Grey (Kay Beach) and Michael Grey; step-daughter, Michele Bogue (Jeff); grandchildren, Christopher Grey, Matthew Bogue and Brendan Rouse; sister, Nancy Assaff; and several nieces and nephews. In addition to his parents, he was preceded in death by a sister, Rose Marie Bartlett. In lieu of flowers, the family suggests memorials be given to Cures for the Colors, 203 Cox Blvd., Goldsboro, NC 27534. To send flowers or a remembrance gift to the family of Robert Walter Gay, please visit our Tribute Store. "Email Address" would like to share the life celebration of Robert Walter Gay. Click on the "link" to go to share a favorite memory or leave a condolence message for the family.